Not ideal for doing the gardening in or mending the car - more of a raising a glass of Champagne or having your hand kissed by a Medici Nobleman type of ring! 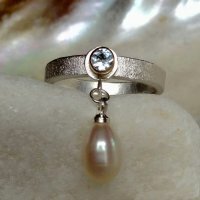 Fun to make, and very extravagant, this silver textured band features a 3mm sky blue Topaz in a gold-filled setting, with a tiny white freshwater pearl suspended beneath it. Chin chin!